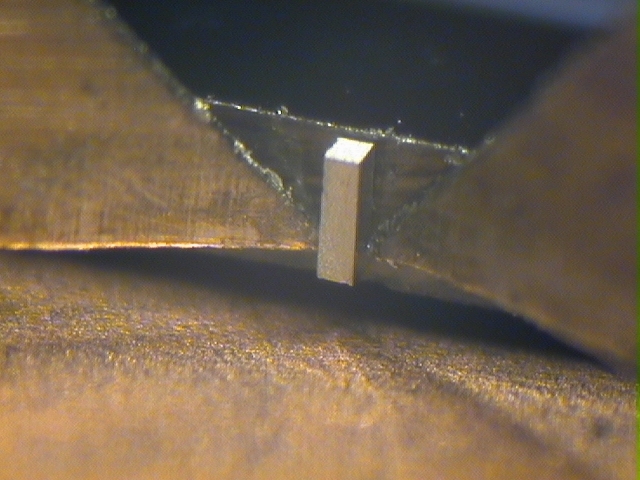 We have developed a set of dextrous micromanipulation primitives for reorienting and regrasping rectangular parts. The parts can be combined to build 3 dimensional microstructures. Some examples from Shimada et al  are shown here. ``Pivot'' grasp using fixture to generate moment on 75 by 100 by 400 micron part, rotating part. Movie of automated assembly sequence (MPEG 1.48 MB). (MPEG 16 MB). This operation is completely open-loop, resulting in accumulated alignment errors. 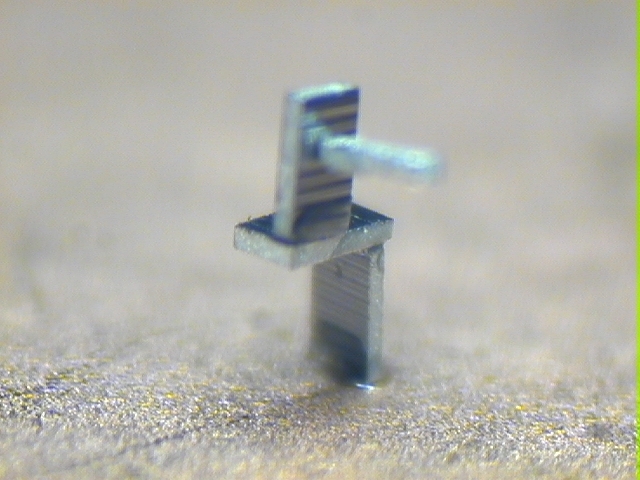 Stacked microparts, bonded with UV cure epoxy. 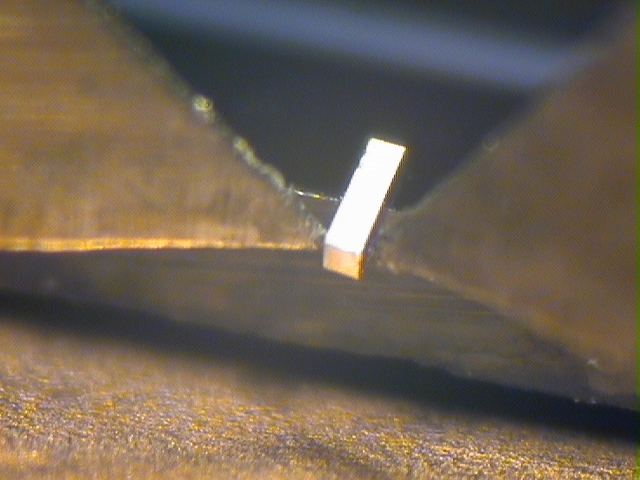 3 large base parts are 400 by 230 by 75 microns thick, top part is 80 by 80 by 430 microns. US Patent 6,798,120 Sept. 28, 2004. IROS 2001, Maui, HI, Oct. 29-Nov. 3, 2001. DSC-Vol. 69-2, pp. 933-940, Nov. 5-10, 2000, Orlando, FL. Nature , vol. 405, pp. 681-685, June 8, 2000. SPIE Conf. on Microrobotics and Micromanipulation, Nov. 2-5 1998, Boston, MA, USA. IEEE Int. Conf. Robotics and Intelligent Systems IROS '95, Pittsburgh, PA August 7-9, 1995. 7th Int. Symp. Robotics Research, Herrsching, Germany Oct. 1995.